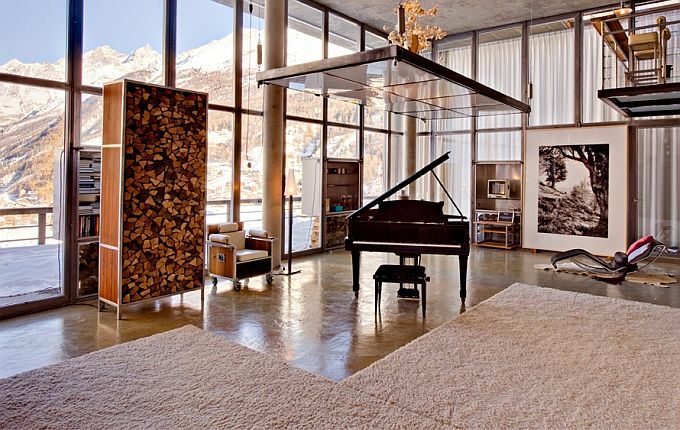 In the Swiss alps lies a most spectacular luxury serviced chalet in Zermatt. It’s a huge Manhattan loft combining a mix of warm woods and industrial aesthetics. 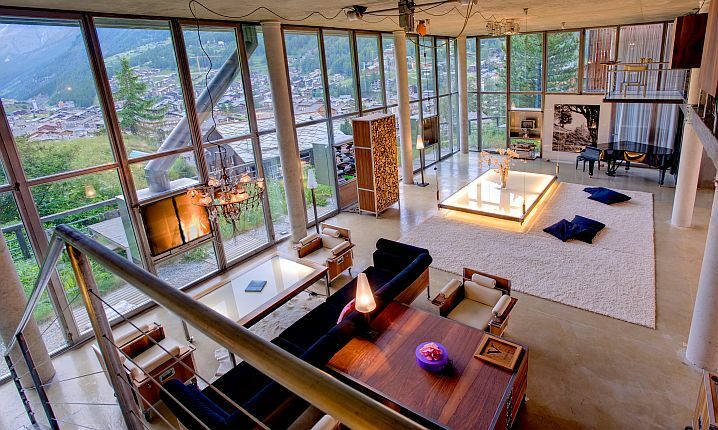 Designed by local interior maestro Heinz Julen, the Loft was the designer’s very own private home now available for bookings through Mountain Exposure. A special key for the Omnia Hotel lifts gives you access to 300m2 serviced chalet where a cavernous glass, steel, textured concrete and wood house greets you. Overlooking a village, the floor to ceiling walls with French windows gives you an unprecedented view of the alps and its surroundings. Automatic exterior curtains gives you privacy should you will it for those debauched weekends in the mountains. Inside the Heinz Julen chalet, the living area packs a large suspended table which serves either as a coffee or dining table and should you need floor space for dancing and orgies- it retracts into the ceiling. Of course, all play and no work makes Bruce Wayne a poor man, two desks and movable armchairs serve for work spaces.